How Can I Keep Yellowjackets Off of My Hummingbird Feeders? By Chris Williams on August 15, 2016. We get this question a lot. 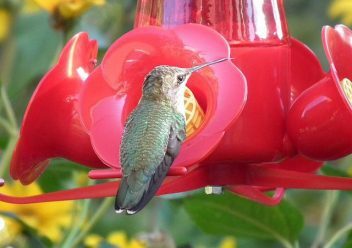 Actually, the question is just as often worded, “How can I keep bees off of my hummingbird feeders.” Folks, these feeder freeloaders are yellowjackets, rarely would you have trouble with honey bees at hummingbird feeders. Unlike yellowjackets, bees know how to work for a living! I wish I knew the answer to this question, I could probably make a fortune. Yellowjackets are extremely persistent when they find an easy food source. Nothing I’ve tried involving the feeders has worked well enough to be considered a success. Even so, I’m providing some of the online tips compiled from both reputable and questionable sources. As an entomologist, I have reason to doubt the science behind some of these “cures” but many claim they work. Use so-called “bee guards” over the feeding ports. These plastic cages fit over the hole or tube. They allow hummers to feed through the openings and do keep yellowjackets (except for the small ones) from getting inside but don’t keep wasps off of the feeders. Make the nectar mix less sweet than normal recipes. Try a 5:1 water to sugar ratio. Use red hummingbird feeders, not yellow. Supposedly, red attracts hummingbirds but yellow attracts bees and wasps. Paint any yellow feeder parts with red nail polish. Move the feeder just a few feet away to a new site. The hummers will find it right away but yellowjackets won’t be able to relocate the feeder. This tip is highly doubtful, my money is on the yellowjackets. When refilling feeders, carefully wash off the outside with soapy water and rinse. Avoid dripping when rehanging the feeder and hose off any sugary drips below if possible. This, to me, seems to be the most useful of the tips. Do whatever you can to keep yellowjackets from zeroing in on the sugary solution in the first place. Install a substitute sugar source just for the yellowjackets. Try a shallow bowl of sugar water or dabs of jelly on a plate placed about 6 feet away from the hummingbird feeders. Expect to attract ants as well. There are also commercial yellowjacket traps that can be hung nearby, hopefully to draw the wasps away from the feeders. Whether these work depends on which sugar source the wasps end up adopting. Get Rid of Yellowjacket Nests and the Problem Goes Away! You realize, of course, that the fact that you have this problem in the first place means that you have one or more yellowjacket nests nearby. Usually yellowjackets nest in the ground but they could also be in trees or shrubs or even nesting in wall voids. As the summer goes on, the nests grow and the yellowjackets forage more and become more annoying. Give us a call at Colonial Pest. Our technicians are very good at tracking yellowjackets and finding their nest sites. Destroying the nests means that you and your hummingbirds can enjoy the rest of the summer in peace. Why Are There So Many Yellowjackets? Hummingbird feeders are strong attractants for foraging yellowjackets.